Join us at Wayland Library for a concert by and for children! Come and be entertained by the young violinists and pianists in our Suzuki program! This is a 100% kid-friendly concert - all the pieces are short, all the performers are too (they're age 4-11), and it's easy to enter and leave at the back! As well as our ever-popular "Intro to Violin" classes, we have NEW classes for babies, toddlers and pre-schoolers coming in January! "The group teacher you have was fantastically engaging." "The developmentally appropriate instruction was exactly what we were hoping for when we chose your school." 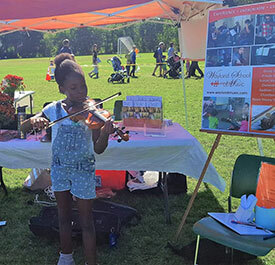 "My children have loved their violin class, especially the easy-going and fun atmosphere." Get your children excited about music and instruments from the very beginning! A warm welcome to the latest additions to our growing faculty - Kenya Esteva de Ruiz and Zhiyue Ali You! Kenya is an extremely versatile musician who will not only be teaching our new group classes for toddlers and pre-schoolers, but also plays and teaches violin, cello and guitar! Ali is a very experienced violin teacher who will be teaching our Intro to Violin group classes, and is also available for weekend private lessons.